I worked on a lovely project last year. Buxton Museum had won first stage HLF funding to do some initial development on their Collections in the Landscape project, and they wanted to use it to test how mobile could bring their museum content out into Buxton town and the Peak District sites that it relates to. This is something I know a number of museums have been trying out and thinking about recently, and it makes sense. If you have lots of artefacts from a particular archaeological site, wouldn’t it be nice if people could see those objects and hear their stories whilst they are at the site itself? They were working with Lord Cultural Resources on this, and Lord hired me to help develop the pilots. I have to say, it was very pleasing to be working on a on a project that was a proper pilot: testing and evaluating the concept with the audience before plunging into building an expensive app. This seems like the ideal model to me, and well worth taking the time to do. As a pilot, though, the budget was limited, there were four ideas to test and no in-house expertise to build an app. We needed to find a platform that already existed to use. I researched a number of options, there are quite a few services out there that allow you to build location based mobile tours and the like, but none were flexible enough or within the price range. Fortunately, whilst working on the Artmaps project for Tate I had met Ben Bedwell, who was part of the project team and the creator of Wander Anywhere (WA). Based on WordPress (which means the back end is very familiar), Wander Anywhere is a tool that allows you to create GPS based experiences: attaching text, audio, images or video to pages that can be triggered on screen as the user gets to a particular point on the ground. The obvious use is to create mobile tours, but you could do something quite playful with it as well. We attempted this at a workshop Ben ran last year which invited a varied group of people (researchers, digital practitioners and museum staff) to use the platform to create something over two days at Wollaton Hall. This slightly silly Wollaton family fun tour was the result of my team’s efforts. If you’re looking at the site on a non-mobile browser, it will just look like a collection of web pages. But, when viewed on mobile, the functionality is completely different: it gives you options for different ways to explore a site (using a compass, or map), and the pages are only triggered when you are in the right spot. A simple mechanic, but one that has lots of potential applications, I think. Now, this is not an app. It is a completely web based experience, running on the phone’s browser. So it has its limitations, requiring a data connection and GPS to work. However, it is really very easy to use. You could put together a mobile tour in an hour, maybe less. For me, this makes it a brilliant prototyping tool, providing you are testing in a site that has a reliable data connection and good GPS coverage. Also, it’s a research project, not a commercial tool, so it’s free. For Buxton, it seemed like the best option. We ended up using WA as the basic platform but Ben did some extra development work on it to style the pages and tweak it a little. As one site, Dovedale, has absolutely no mobile signal, we decided to do a PDF family tour there instead that could be downloaded in advance, but the rest are WA based. The result is the Buxton Museum apps site here (best viewed on mobile for the full effect), which was launched and trialled at the beginning of 2014 (but is still live). 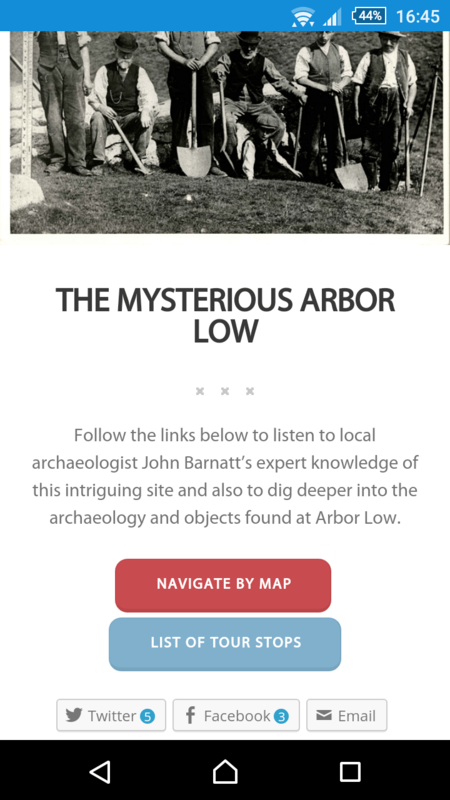 They are fairly simple, but each tries different things: Buxton Shops features wonderful reminiscences from local residents and asks for contributions from users, Buxton Waters is GPS triggered, Arbor Low is packed with extra content and set at a remote stone circle and barrow site. This meant that Buxton could evaluate the success or otherwise of the different features. For example, I think it’s fair to say that the GPS triggering proved difficult in a small town area. Lesson learned. Buxton’s Collections in the Landscape blog is well worth reading, they’ve been very open about the whole process. There are a couple of posts on there about the trials they ran with the mobile tours (here for Dovedale, and here for Arbor Low) and many others on aspects of the funding applications, other digital experiments (e.g. with History Pin) and general museum objects and stories. And the good news is that they’ve been successful in securing second round funding, so the full project is now well under way. 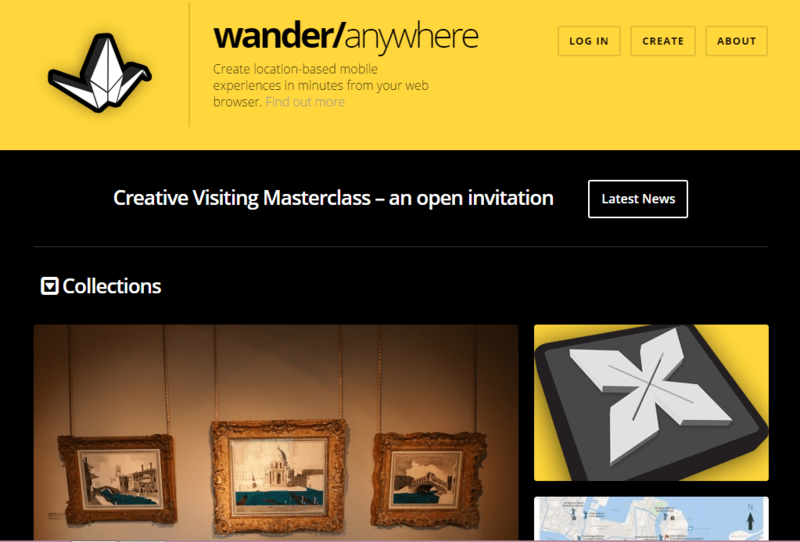 We’re currently in the middle of running a Creative Visiting Masterclass, which is a set of 1-day workshops looking at a range of different visiting technologies (including Wander Anywhere, but also visual markers, NFC, iBeacons, and so on): see http://wanderanywhere.com/cvm15/ . In terms of projects, it is currently at the Venice Biennale: see http://em15venice.co.uk (there is an on-location experience, via http://wanderanywhere.com/em15/) and we’ve got a few projects at proposal stage to look at cultural heritage applications. I highly recommend having a play around with WA. Having the opportunity to try out a locative experience before a huge amount of build begins is really very valuable. I’d also love someone to come up with a game for it, at the workshop we were very taken by the fact that if there are multiple media points overlapping at one site, it will deliver one at random. There’s got to be a game in that, any ideas?